Friends of the Boar want to see wild boar back in the UK. We want to see wild boar managed properly without cruelty. We wish to share our views of how to live safely and peacefully alongside the wild boar. Presently, we don't believe wild boar are being treated fairly nor is science used to assess and manage the population. We believe the public are misled about the true character and socio-economic benefits that they bring to Britain. This blog is hopefully going to become an online source of information about the Wild Boar in the Forest of Dean, Gloucestershire, and sometimes elsewhere as well. It has been created to help inform and educate the public about the boars here. We are not an Animal Rights group although we often have sympathy which such groups. Rather, we use science together with observation and reasoned argument to deliver our argument and opinion. We do not preach nor intimidate anyone who has an opposing viewpoint. This is our strength and we will do our very best to keep on this track. We are a group that hope to grow stronger in the coming years and become a respected voice in support of the wild boar. We believe the boar are the start perhaps, of a counterweight to a mindset who are persuaded more by profit than peaceful coexistence with all our native wildlife. The boar, if accepted, will hopefully pave the way for other long lost species re-introductions into the UK fauna. Ours is a group created in response to many years of poor, and at times inaccurate tales of the wild boar in the media which has spread throughout a misinformed public at large. We hope to highlight what the wild boar can represent. But most of all we want to be a pressure group that can promote the wild boar in a positive way and also an objective way, and as such we will constructively criticise any authority or group who appear to be endangering the boars, their existence and their health. Wild Boar can sometimes be dangerous or troublesome. We do not want to hide from these facts. We do not want to be rigidly against management or culling of the boar. But we do want a balanced and sensible approach to being able to once again live side by side with the new wild arrivals to our forests. If you are already a friend of the boar, please let us know so that we can add you to our list of supporters. We hope to keep you informed of things happening locally in the Forest of Dean, and maybe beyond, by email. We need your input as we hope to be as democratic as possible in any of our future actions. Boar Digging or Boar Damage? 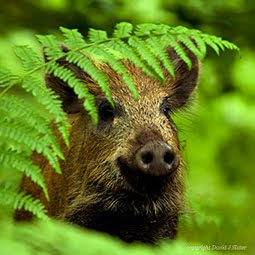 A no-frills group of wildlife enthusiasts, scientists, photographers and local residents wishing to see wild boar and all other wildlife thrive in the Forest of Dean and elsewhere in the UK. Founded by David J Slater and Joyce Moss in the summer of 2011 as an independent conservation group with no prior affiliations. Hoping to promote understanding of wild boar and as a pressure group to produce a realistic and science-based management plan of wild boar in the UK. E-mail us via "my complete profile" below. Media enquirers only - please telephone 07999950697. 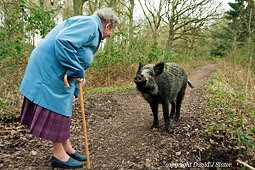 View the Forestry Commission's proposed feral wild boar management plan until 2016..
View the Friends of the Boar response. The call for responses is closed and has now been scrapped it would seem, but feel free to send your concerns to: The Forestry Commission, Bank House, Coleford, Glos. Only 2 responses were received, with ours being the only substantial one. 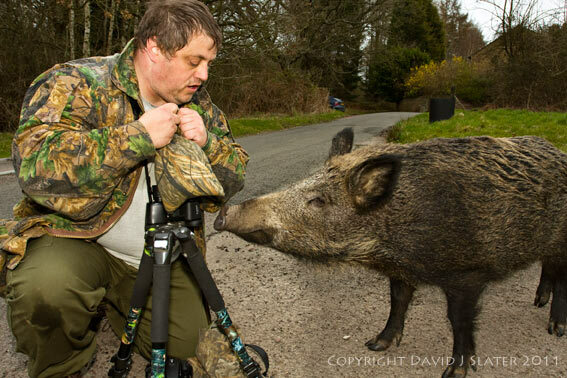 "Be careful Boris, humans can be aggressive"
We predict there will be many good and possibly rare photos of UK wild boar posted here over the coming years. We are supported by many talented wildlife photographers. Please remember all photographs on this site are protected by UK Copyright Law and cannot be used without permission. Anyone wishing to use photos from this site please seek permission from the named photographer or via this blog. Thanks. All Images and graphs have Copyright. Contact Site for Permission to Reproduce. Watermark theme. Powered by Blogger.